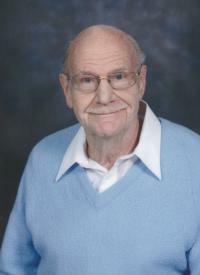 Donald Lloyd Eberly passed away peacefully at the age of 86 years after a ten-year battle with Parkinson’s Disease. He will be forever loved and remembered by his wife, Dolores; of 63 years, daughter, Karen (Craig) Banks; son, Bill (Marianne); grandchildren, Lauren (Sina) and Graham Banks, and Zoe (Dustin) and Spencer Warry; sister,Thelma Mauch ; brother, Duane (Emily); as well as extended family and many friends. Don was born in Hanna, Alberta. He was an electrical estimator and designer before retiring in 1992. He enjoyed travelling for work and pleasure, playing the piano, listening to all types of music, and sports. He especially enjoyed watching the Oilers this past season. Don was a devoted husband, father and grandfather. A Celebration of Life will be held at Rio Terrace Community Moravian Church, 15108 – 76 Avenue, Edmonton on Friday, April 7, 2017 at 10:30 a.m. In lieu of flowers, donations may be made to the Good Samaritan Society, Dr. Gerald Zetter Choice Program, 8861 – 75 Street NW, Edmonton, AB, T6C 4G8. We wish to express our sincere thanks to the wonderful staff at the Zetter Choice Program and the Grey Nuns Hospital for their outstanding care and compassion.